The "NASA's Missions: Imagine and Build" contest invites LEGO fans to design and build future NASA air- and spacecraft. NASA is challenging the next generation of aerospace engineers to toy with ideas for the future by using LEGO bricks to launch their concepts for advanced aircraft and spacecraft. The U.S. space agency and Danish toy company, which recently ended a partnership to fly the iconic plastic construction sets on the International Space Station, are now jointly presenting the "NASA's Missions: Imagine and Build" competition. The contest, which is open to teenage and older LEGO fans, began on Wednesday (June 5) and runs through July 31. The "NASA's Missions: Imagine and Build" competition is divided into two categories: the aviation-themed "Inventing our Future of Flight" and spaceflight-centric "Imagine our Future Beyond Earth." In "Future of Flight," participants 13 years of age and older are challenged to design and build their idea for a future aircraft based on the real concepts and technologies that NASA's aeronautics division is developing to increase fuel efficiency and reduce harmful emissions and noise. In addition to building a model of an aircraft, entrants must also write a technical paper that explains how their design takes advantage of NASA's ideas and potentially improves on them. In "Future Beyond Earth," LEGO and space fans at least 16 years old design and build a futuristic vehicle from the toy bricks that might travel through the air or outer space. The design can be based in reality or on purely a flight of fancy, but must have a relationship to a mission NASA is planning to launch now through the 2030s. According to NASA, entries can "be an airplane, rotorcraft, rocket, spacecraft, satellite, rover or something else." For both categories, entries can be photos of actual LEGO models or virtual creations using the free software LEGO Digital Designer. All model designs submitted become the property of LEGO. The grand prize winner of the "Imagine our Future Beyond Earth" category will receive a limited edition LEGO CUUSOO Hayabusa signed by LEGO designer Melody Louise Caddick. A panel of LEGO and NASA representatives, including an astronaut, will judge the entries. Five winners in total will be chosen: one young builder and one overall first place winner from the "Future of Flight" category and one grand prize winner and two runner-ups among "Future Beyond Earth" entries. The winners of "Inventing our Future of Flight" will receive a LEGO trophy and a collection of NASA memorabilia, as well as have the chance to present their ideas to both toy and aeronautics specialists. The grand prize winner of the "Imagine our Future Beyond Earth" category will be awarded a limited LEGO CUUSOO Hayabusa spacecraft set signed by a LEGO designer, as well as be recognized by NASA on its website and receive a collection of NASA memorabilia, including the autograph of the contest's astronaut judge. The runner-ups will receive a LEGO set and a collection of NASA memorabilia. The winners will be announced on Sept. 1. The "NASA's Missions: Imagine and Build" competition is the latest joint project in an ongoing partnership between LEGO and NASA. In addition to flying sets to the space station — including a scale model of the orbiting outpost itself— to appear in educational outreach videos, LEGO minifigures have landed on Mars and are now on their way to Jupiter on NASA's Juno probe. LEGO also released a set of four toy sets in 2011 that included information about NASA's activities. 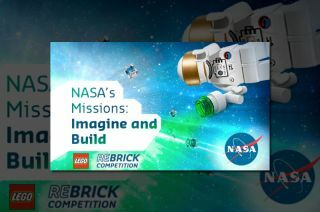 For more about the "NASA's Missions: Imagine and Build" competition, see LEGO's Rebrick website.